Aiming to compete internationally with South Africa's Garden Route and America's Pacific Highway, The Wild Atlantic Way is a tourism trail on the west coast, and on parts of the north and south coasts of the Republic of Ireland. 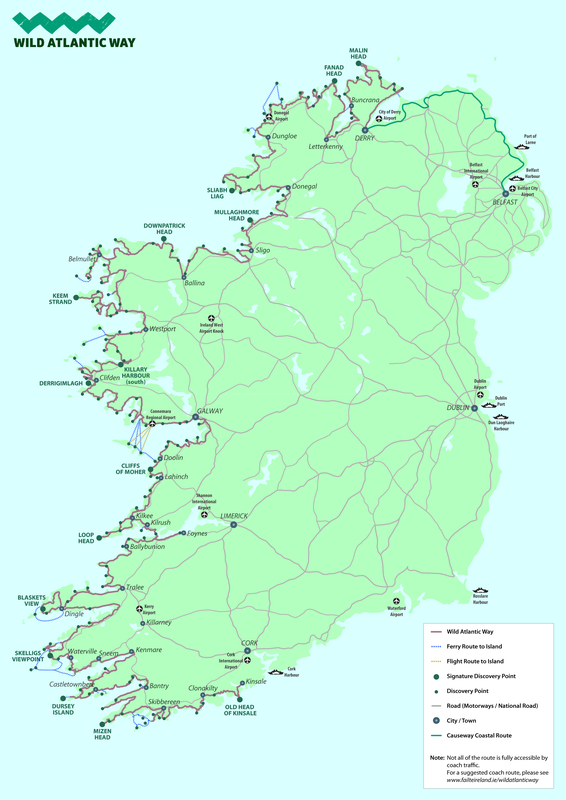 The 2,500 km (1,553 mile) driving route passes through nine counties and three provinces and stretches from Malin Head in County Donegal to the Old Head of Kinsale in County Cork. Ireland's tourist industry wants to attract tourists to what it claims is the "World's longest defined coastal driving route". The route is broken down into 6 sections. Malin Beg Beach - Glencolmcille is a coastal district in the southwest Gaeltacht of County Donegal in Ulster. Malin Beg features The Church of St Kevin and a ringfort. Lots of information can be found on the official website and it includes a handy trip planner to help you on your way.